The 2,000-year-old Colosseum is an architectural masterpiece of the ancient world and a must-visit on any trip to Rome. In a city of legendary fountains, the Trevi Fountain guarantees to take your breath away, not to mention your loose change! The Spanish Steps are an iconic monument and fashionable meeting place all rolled into one. Rome’s famed Baroque square that has been home to Popes and film stars alike. Breathtaking Renaissance masterpieces by artists such as Caravaggio, Raphael and da Vinci await in these magnificent museums neighbouring the Sistine Chapel. Great place for visiting main attractions in Rome including The Spanish Steps, Pantheon, Trevi Fountain and The Vatican as well as brand name shopping, churches and numerous restaurants and eateries. 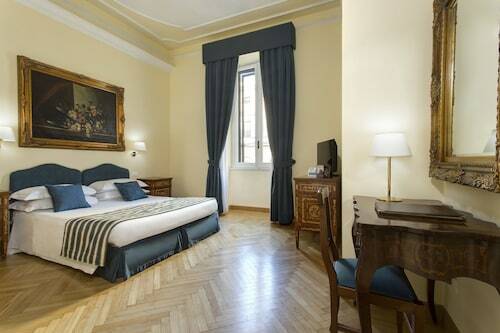 A wonderful boutique hotel that has fantastic customer service, is clean, has wonderfully appointed rooms and is close to all the main historic sites in Rome. 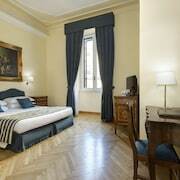 Within walking distance of the Termini and very reasonably priced, this hotel was a very good choice in Rome. Rooftop bar a great place to relax and look over the skyline of Rome - Great photo spot..would recommend this hotel highly. 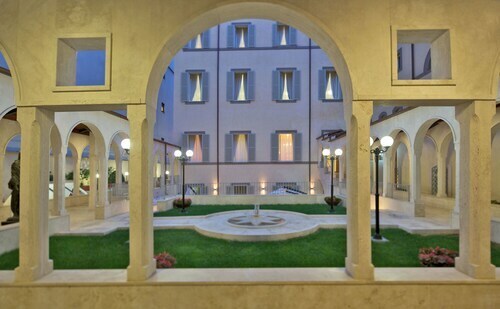 The reception staff were equally able to make us feel at home with friendliness and attention to our requests for assistance, especially getting taxis and other transport enquiries around Rome. 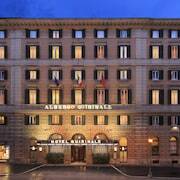 Very good location if you don't want to walk as you can get on the train which is about 2 blocks away and visit all the locations in Rome easily. Everything was great. 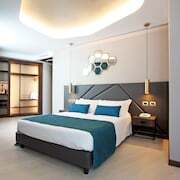 Close to airport for a convenient overnight before flight. Airport shuttle is fast. Had trouble finding it at airport as I was looking for a small Hilton Bus and what I should have been looking for was a large white and orange Airport Shuttle Bus that run a route around the airport picking up and dropping off people not just going to hotel. Was most efficient and fast but the driver doesn’t announce stops. If you’ve never used it before the hotel is the last stop. The airport is small (compared to Toronto YYZ) so the Terminal 1 and Terminal 3 are fairly close together so you aren’t going to have an issue if you miss hopping off at Terminal 1, about a minute depend on the traffic in the loading/unloading area. The Hilton Garden is nice hotel. Check in/check out is a breeze. Staff are very nice and speak English. Hotel is clean and spacious. Rooms are a good size and up to date. Beds are fine. Bathroom is nice and modern and includes the essential amenities, soap, shampoo,conditioner, heating towel rack, hairdryer. Coffee maker in room. No carpeting in rooms so they feel more clean. Breakfast was just ok; croissants and pastries tasted stale. there are an assortment of choices; eggs, toast, bacon and sausages etc. The food in the bar area is ok but you’re just going to eat to fill the gap. Overall the food was a disappointment as I guess because everywhere I stayed on my 3+ week journey had been excellent. You’re not staying here for the food. The property itself is quite comfortable and modern. However, we were given a substandard room under the roof with sloping ceiling that made it hard to walk around the bed. Almost no international television available. Wi-fi connection erratic. Shuttle connection only every 45 minutes. 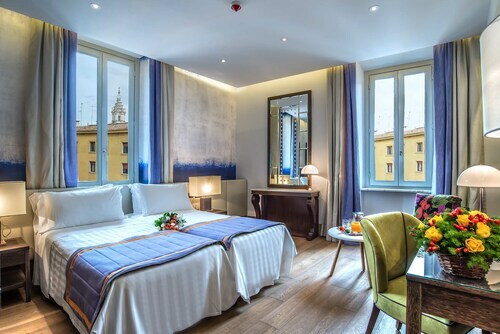 Turn to us here at Expedia.co.nz when you’re looking for Rome accommodation. 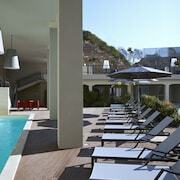 We offer cheap deals on a vast selection of places to ensure they meet your needs and budget. Whether you’re looking for family-friendly resorts or 4-star hotels in Rome, we’ll pair you up with a place that matches your holiday style. One of the easiest ways to arrive in Rome is by flying into the Leonardo da Vinci International Airport (FCO) and hopping on the express train to the Termini Station. If you choose to rent a car in Rome, realize that driving can be dodgy as drivers tend to be aggressive and the streets are exceptionally narrow. 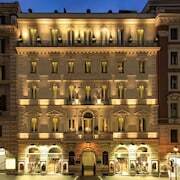 From budget motels to luxury hotels in Rome, we offer it all. Take a look at our selection to find lodging that aligns with your preferences and price range. Looking to have more money to splurge on your Roman adventures? 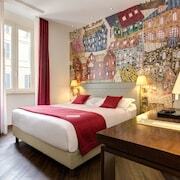 Bundle Rome hotels and flights into one travel package and save extra cash. Hop on a Vespa and get ready to explore the ancient city in no time. Explore Rome with Expedia.co.nz’s Travel Guides to find the best flights, cars, holiday packages and more!